In dir liegen Stärken, Fähigkeiten und Energien, mit denen du heilen und dein Leben verbessern kannst. Bringe bitte bequeme Kleidung, und gerne auch eine Decke oder Schal. Wir haben Matten und Decken. Marianne Schmidt wurde in Indien geboren und wuchs als Nomadin auf. Lehrerin. Sie ist auch Mama, Tänzerin und Designer. Yoga Nidra stimulates the hormones in the pineal gland, which releases melatonin — a horomone that reduces stress, boosts the immune system and helps prevent illness. Regular practice helps harmonize the brain hemispheres, promoting better mental performance. part of you, you gain access to innate knowledge and wisdom that can positively transform your life. Within you lie strengths, abilities and energies that you can use for healing and improving your life in many ways. Yoga Nidra is the easiest and most effective way to create a bridge between conscious awareness and your subconscious mind. It is a tool for mining the strengths and talents that usually lie hidden within you, buried under old patterns. Please bring comfy clothes, an blanket or shawl. We have a lot of mats, cushions etc, but the more the merrier. Marianne Schmidt was born in India and raised nomad. She is a qualified med. masseuse, balneotherapist and yoga instructor. She is also a mother, dancer and designer. 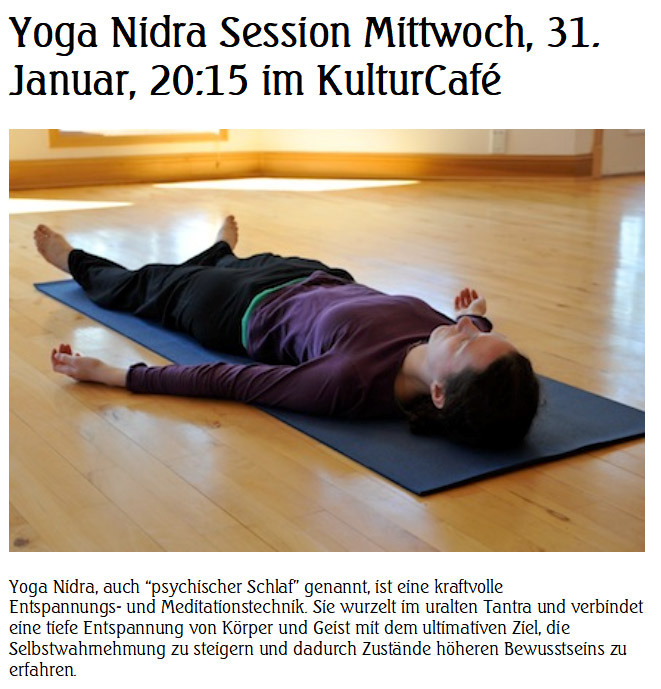 The Yoga Nidra Session begins with a small explanation of Yoga Nidra, a physical Asana practice from Hatha and Kundalini, a long Savasana with guided mediation. After the practice there will be tea and time to chat and share. 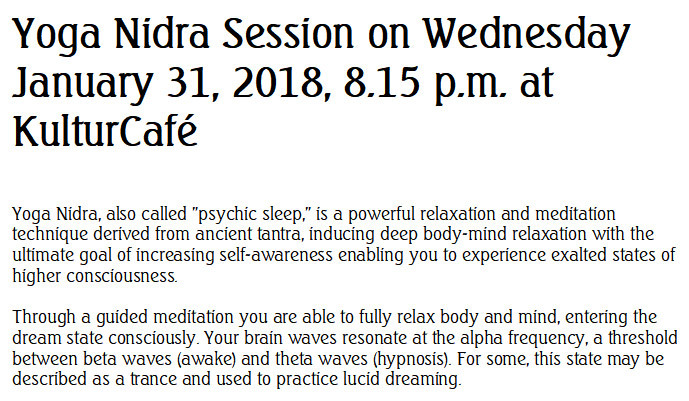 I would like to host this meditation in english since I usually do it in german and have had requests from english speakers. But I am bilingual and can also do it in german, if so desired, and more german speakers attend.